Pharmaceutical and health program managers in Namibia’s public health sector now have a tool to more accurately monitor stock levels and availability of all pharmaceutical products at health facilities countrywide. This follows the launch of the Pharmaceutical Management Information Dashboard in Windhoek, on Thursday, June 23, 2016. Until recently, pharmacy personnel at the Ministry of Health and Social Services (MoHSS) have been using a tedious and cumbersome paper-based inventory management system. The manual system was also prone to inaccuracy. The immense labor involved in operating this inefficient system could have otherwise been devoted to patient care. In addition, managers at different levels of the MoHSS hierarchy had poor visibility of stock status information across the country, rendering them unable to make timely pharmaceutical management and programmatic decisions. The US Ambassador to Namibia, H.E. 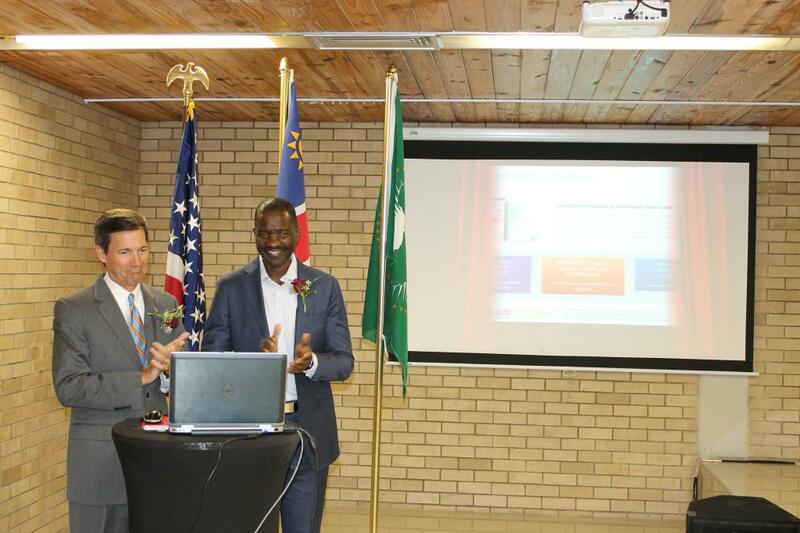 Thomas Daughton (left), and the Minister for Health and Social Services, Dr. Bernard Haufiku (right), launch the new Pharmaceutical Information Dashboard at the Windhoek Central Hospital, Namibia, on June 23, 2016. Since June 2015, the Systems for Improved Access to Pharmaceuticals and Services (SIAPS) team in Namibia have been adapting, improving, and implementing an innovative web-based Pharmaceutical Management Information Dashboard to enable MoHSS managers to have better visibility of stock status data to support evidence-based pharmaceutical supply chain decision making. This Dashboard makes it easier for managers to identify potential stock-outs or overstocking, thereby facilitating the redistribution of excess stock to where it is needed, hence avoiding wastage from expiries. The Dashboard has an inbuilt early warning system that alerts supply chain managers of potential stock-outs of medicines, vaccines, and clinical supplies. The antiretroviral treatment (ART) module provides summary statistics about the number of people accessing HIV treatment. Managers at MoHSS have extolled the ability of the tool to provide advance warning of potential stock problems. Also embedded into this versatile tool are 22 essential pharmaceutical information indicators tracked by the Ministry on a regular basis that provide a nation-wide view of the status of pharmaceutical service delivery. The perennial shortage of pharmaceutical staff and the escalating patient case load due to new emerging and re-emerging diseases has particularly made it difficult for health workers especially in the public sector to operate effectively without modern tools such as the Dashboard. According to the MoHSS Minister, Dr. Bernard Haufiku, the tool will enable health managers to have a clearer picture of inventory levels of medicines and other health products across the country. 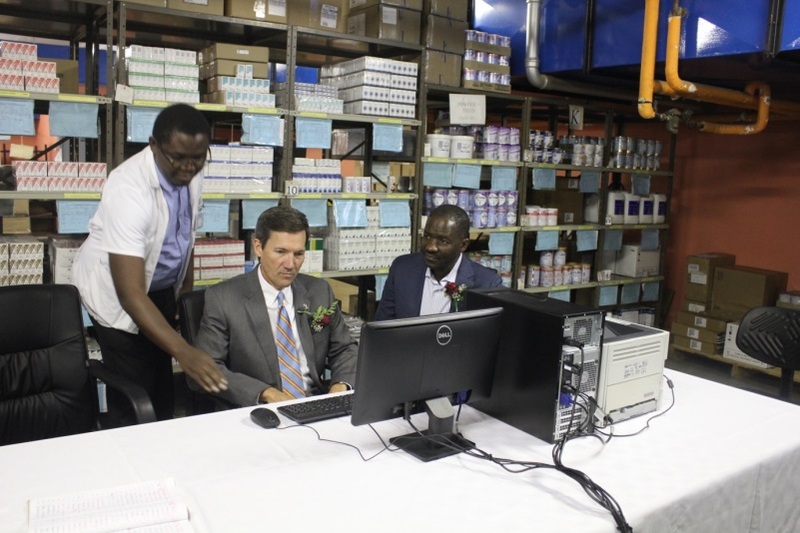 Windhoek Central Hospital Senior Pharmacist, Mr. Robins Oyo (left), demonstrates how the Dashboard’s FESC works to Ambassador Daughton (center) and Minister Haufiku (right) at the hospital pharmacy. “I am therefore confident that the Dashboard we are launching today will go a long way in immensely helping the few and overstretched pharmacy staff to manage pharmaceutical supplies at their respective health facilities in an efficient manner,” said Minister Haufiku. Currently, 15 of the 35 district and referral hospitals in 7 regions of Namibia are using the Facility Electronic Stock Card (FESC). FESC is a computerized management system that feeds stock data into the Dashboard. The FESC automatically calculates health product usage and generates stock status reports; produces an accurate requisition to medical stores for resupply of health products; and also provides auditable records of transactions for accountability purposes.